Sunset Cottage01328 878836work Self-cateringSunset Cottage is a detached two bedroom 4 Star cottage set in quiet North Norfolk village only ten miles from the coast. Situated next to owner’s property with private parking and pretty garden overlooking open countryside, it’s an ideal base to explore North Norfolk with its Nature & Bird reserves, cycling, walking and other various attractions. 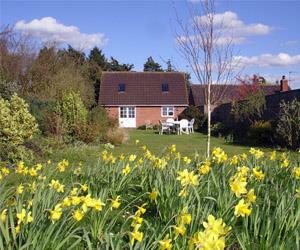 Sunset Cottage is a detached two bedroom 4 Star cottage set in quiet North Norfolk village only ten miles from the coast. No smoking Children welcome from age 8. Coming from Kings Lynn, when you arrive at the first roundabout (Shell Garage) at Fakenham, follow the A148 Cromer, go straight over the next roundabout (Morrisons and football ground), follow the road for approximately 2 miles and about 100 metres after the speed camera, at the staggered crossroads, turn left, signposted Lt. Snoring/Gt Snoring. Travel one half mile, going past Bell Close on your left, another 200 metres on, you will find Sunset Cottage on your left.